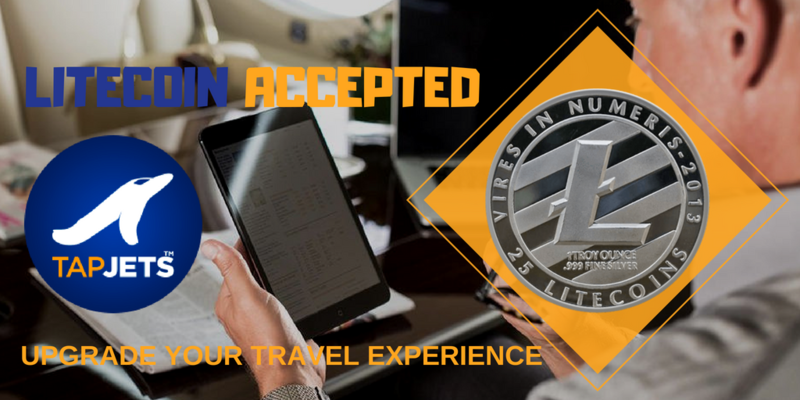 HOUSTON, TX, May 30, 2018 /24-7PressRelease/ -- TapJets, the private jet instant booking platform, has added Litecoin ($LTC) as an approved form of payment, giving customers yet another instant payment option to augment traditional credit card payments and bank transfers. This new offering allows TapJets' customers to instantly book private flights from their smartphones and head to the airport while the blockchain transaction is completed in the background. "We are excited to add Litecoin to the Bitcoin and Ethereum payment options we already accept," said Eugene Kesselman, CEO of TapJets. (@EugeneKesselman) "The Litecoin community is strong, and we are happy to work with the Litecoin Foundation to welcome them to our platform. Making it easier to use cryptocurrency in more places is what separates the leaders from followers. This is precisely what the #PayWithLitecoin movement is all about." "It's great to see that TapJets is now allowing their customers to pay with Litecoin," said Charlie Lee, Creator of Litecoin. (@SatoshiLite) "Its speed, liquidity, and ease of integration make it the perfect cryptocurrency for payments. It's also exciting to see how our community helped make this partnership happen." TapJets instant booking platform is the only platform in the world where you can book your private jet in less than one minute. With over 16,000 clients accessing the platform to book their flights and bid on Flight Auctions. TapJets TITAN platform provides Travel Agents with private jet booking capability and Plane Factor platform connects operators and pilots directly with their flying customers. For more information please visit www.tapjets.com. The Litecoin Foundation is a non-profit organization whose mission is to advance Litecoin for the good of society by developing and promoting state-of-the-art blockchain technologies. Registered in Singapore, the Foundation is comprised of fulltime and volunteer support from around the globe. For more information, visit www.litecoin-foundation.org.